Awesome topic, Phil! The bottom line is, however, that you CANNOT stay 100% private. Some of these sites are getting information directly from the government databases, and as you know when a business registers they MUST fill in an address. Additionally, Express Update is just too important a source of local SEO goods to be overlooked. It doesn’t really get traffic by itself, but it feeds data to many that get. Besides the sites you mentioned, I think a few others are worth mentioning as important in this case, too: local.com, whitepages.com, yellowbook.com. All of these get very serious traffic by themselves (http://www.screenwerk.com/2011/08/12/compete-yellowpages-com-top-local-site) so if a business owner doesn’t really want a lot of publicity to their address, they should try and hide it there. Unfortunately, I am not so sure this is possible on all of them. Again, great topic and nice explanation, as always. Thanks for weighing in, as always! You’re right that it’s probably not possibly to get 100% “secrecy.” I kind of mentioned that as a caveat in the “A few notes” section at the end: that you may not be able to hide the address so completely that a determined digger couldn’t find it. Normally I wouldn’t tell anyone to suppress his/her ExpressUpdate listing, either. But if a client was *really* concerned about privacy, I’d still say “go ahead and suppress it,” with the caveat that doing so may hurt his/her rankings. Then again, on the other hand, I’d say that if the other major third-party listings all had consistent NAP and so forth, the rankings may be fine. It would just depend on how adamant the client is about privacy relative to how adamant he/she is about rankings. I agree that to the extent someone wants to hide the address on other big sites, that person should go to them one-by-one (point #4 in my “Recap” section). To some extent this is theoretical, because none of my clients has been so concerned about privacy as to want to keep the address a complete secret. But it does seem there are *some* limits on the level of privacy you can reach, as you said. I’ll check those good sites you mentioned to see if one can “hide” an address on them. Phil. Great article & thanks for the shoutout for GetListed. This one is definitely in my bookmarks because it’s such a common question. I did not realize that so many sites now allow you to hide your address. In addition to what you guys at GetListed do for business owners who show up to Local U, you’ve created some truly indispensible resources, which I constantly find myself referring to, piggybacking off of, and urging business owners to use. Thanks for all you do in that regard. It does seem that more sites are now allowing business owners to hide their address. I think it would be interesting to see if / how the “privacy” options on these sites and others change over time. Wow! This is the first time I’ve seen anyone tackle this particular topic and the coverage here is in-depth and excellent. I had no idea that so many of the major local business listing sites allowed the address to be hidden (sometimes, it’s hard to think beyond the world of Google) so this comes as a surprise to me. I am sure I will be pointing to this article in future from fora threads, etc. Really fine reportage here on a very under-reported subject. Thumbs up! Thanks for your compliments! I’ve admired the work you’ve done on your blog for some time now. Yes, it’s definitely easy to forget that there’s a lot of “local” outside of Google. What I always have to remind myself– and many clients – of is how much it influences what goes on “in” Google. As it relates to keeping one’s address private (or at least as private as possible), I think of the “local search ecosystem” as a huge gossip mill. All these sites whispering to each other (“Psst…did you hear where ABC Lawn Care is? The owner lives in those hip new apartments two blocks from here! I guess they have a dog, too!”). I’d really be interested in hearing anything you unearth or stumble across regarding the whole privacy issue in general. As you said, it doesn’t get nearly enough attention. Hi Phil, thanks for the info but I don’t see where you’ve covered my problem. I’m a web designer who works from my home. I used to have my address listed in Google places and my website when I lived in a larger city just for the local traffic, however since I moved to a small town I don’t want Google listing my service “only” locally because I service clients across the USA. Can you suggest how I should proceed? Interesting question. I would think that you could get most or all of the privacy you’re after if you go to all the sites I mentioned and hide your address from showing on those sites. It will take some “scrubbing” and some time, obviously. Still, that’s how I’d proceed. Hiding your address won’t change the local area you’re visible in. Let’s say you rank top-7 in the Google+Local results within a 10-mile radius around your house. Changing your address-display preferences won’t drop it down to a 5-mile radius. Because there’s no way you’re currently visible in the Google+Local results to clients “across the USA,” there’s no way your nationwide visibility will be affected. thanks Phil. I’ve been concerned about this for a long time. Finally have a plan. No problem! I’m glad that seems to help. This is a great article Phil! I have a client in the UK who runs an antiques company. When I started discussing the importance of local SEO, said client got very worried and explained the dangers in their line of work. Client knows a number of other people in the same industry who have been robbed, mugged, followed home, etc because their address could be found online. I have been at a loss until I came to your article – a big thanks! Of course it will be different for the UK market but at least I feel inspired. Do you have any experience with UK local SEO that applies in this situation? I know what you mean: I’ve never heard of incidents like the ones you referred to – certainly not with the many business owners I’ve dealt with first-hand – but there are some real crazies out there. Yes, I’ve got some experience with local SEO in the UK and some experience in the whole privacy issue, but I’ve never dealt with someone in the UK who’s particularly focused on keeping the address under wraps. But I imagine it would be easier to pull off in the UK than in the US: the local-search ecosystem there is much more fragmented than it is in the US, mainly because there aren’t major data-providers that have the same pull as InfoGroup and LocalEze have here. As I mention in the post, InfoGroup (AKA ExpressUpdateUSA.com) is the main stumbling block to keeping your address private in the US. It splatters your business all over creation, at least in the US. But there’s no equivalent of that in the UK (at least that I know of). It’s mostly yellowpages-type sites, where choosing to “hide” your address generally is very easy to do. Long story short, for you clients in the UK, I’d suggest checking out the citation sources mentioned in Nyagoslav Zhekov’s great post on UK citations, as well as the ones in my post on the topic, and then trying to hide your client’s address on each of those sites. Thanks Phil for that feedback – a big help and much appreciated! Security concerns have been my major concern about lisitng locallly. Awesome article! Glad you like it, Charles! Just wondering how this affects businesses which rely on keyword searches which trigger “local” results…the ones with the map listings and red lettered sequential listings. How can they actually “rank” well in these listings without having their address shown? I ask only because I have a client whose physical business location address has been totally shut out by Google (I have ranked him #1 until February of this year…and recently dropped off completely…yeah, like not even through page 10! ), because they removed the name of the street his business in on in Google Maps…like, there is a street with no name. So we toyed with the idea of using his home address; but his clients are corporate clients who look for stability and reputation (can’t really portray this with a picture of your house for your business address). So, I would guess you mean “rank well” by being the first in the organic listings? Which is below the fold on most computers, btw… Or have I misunderstood? Great question. Obviously, I don’t know the specifics of your client’s case, so I can’t say for sure what role – if any – the address might play in his rankings. But, in general, a business CAN rank well in Google+Local (AKA Google Maps, AKA Google Places) without revealing its address. I’m not referring to the organic rankings (my suggestions here don’t affect those). Merely the act of hiding one’s address doesn’t kill your rankings. None of my clients took a hit after Google *required* them to hide their addresses (around February/March). It won’t help your rankings, either. It just doesn’t affect them. Thanks for commenting! (Wish I were using a website that I needed to rank for my consultant business…) This is an interesting topic since, I haven’t yet seen a Google+ Local page without an address…that’s not to say there aren’t any, by any means. That being said, since they would rank in local results (all the AKA’s above), would they have a lettered marker on the map on the SERP page? I mean, if you were to actually click on the lettered place marker, you’d open up Maps…then if you find it again and click on it once more, you see the map citation for the business, right? And this still wouldn’t have the address? I’m not sure if what I’m saying makes much sense, but this is my one thorn-in-the-side client who is about to fire me…while all of my other clients want to pay me more! It’s really funny since this particular client (commercial concrete contractor) enjoyed five front page results (top-of-page paid, local, website – #1, Facebook, & Youtube!) for a whole year after contracting with me…and in February the Big G decided that his street name did not exist anymore! Go figure! I mean it’s the only street I’ve seen on Google Maps WITHOUT a name…I’ve even submitted it via the maps edit function and the revision was accepted, but never implemented. I guess I’ll just have to say goodbye to that $700 per month…hey, I guess I’ll have to make another sale! There are TONS of examples of high-ranking businesses that have the address hidden. Here’s the example of a client of mine: https://www.google.com/search?q=mountaintop+roofing+glendale+co. He’s #1 for “roofing” in Glendale, CO. We hid his address not because of any privacy concerns, but because in February/March Google required businesses that travel TO customers to do so. Not sure if that answers your first question. If you post a link to your client’s Google page or just specify his address or what used to be his address, I could take a very quick look at the “disappearing street” situation. Oh, that is awesome! I see the marker is rendered as a “circle” instead of the typical “pin”-type marker. Very interesting! Here is a map link to my client: Pavement Services. Notice that the street, McGrew, is not even labeled on the map. The problem is compounded when I click the “See you listing on Google” link within the places dashboard. As you can see, Google give me the “We currently do not support the location” message. Also, when I try to edit it from within the Places dashboard, the map does not show on the right-hand side of the edit page. When I click the “Fix incorrect marker location” link, Google simply give me the pop-up message that says, “You need to enter your address before moving the map marker”…even though the address has been entered and the business has been verified by postcard. Really weird, I tell you. Thanks for taking some time out and looking at this when you can. I’ll anxiously await your comments! I don’t think Google has any trouble recognizing McGrew Street. Other businesses are located and listed there (as you know). I can even take a stroll down it on street view. It’s a bit puzzling that Google doesn’t have the street labeled, but that happens every now and then. The street I grew up on isn’t labeled in Google Maps. Same deal. The McGrew address doesn’t seem to be an issue. I wouldn’t mess with the marker or anything. I’m pretty sure the issue is your client is getting whacked because his Google listing is titled “Houston Paving Services.” The inclusion of city names in the “business name” field is a no-no. I don’t know if “Pavement Services” is your client’s DBA, but whatever his most “official” business name is, that’s what you’ve got to use as the name for his Google listing. For a fun way to re-digest Google’s quality guidelines, check out my post from April on the topic. Once you’ve got the Google+Local name squared away, obviously you’ll want to go to the main citation sites and data providers to make sure your client’s info (name, address, phone number) on third-party sites reflects what’s on his Google listing (more info here). Actually, I just changed that to include “Houston” since I’ve started working on another location for him, and I wanted some differentiation within the Google+ Local pages manager…It had always been just “Pavement Services” and citations (NAP) have been created. I’m approaching this as now having two locations. This is really frustrating as even the second location (his home) now also has the “We currently do not support the location” message…There are so many bugs with Google+ Local and it’s integrations with Google Places that it’s driving me crazy! I’m just glad all of my other clients are not experiencing this issue! Thanks for trying to help…I’m afraid I’m going to have to tell him that I cannot help…it’s funny actually, since the number one listing for his category has ONE review! Tons of bugs in Google (especially now), for sure. But I don’t think those are what’s at work here. Again, I’m 95% the problem is your guy is getting penalized for the “Houston” in there. Anyway, whatever you choose to do, good luck! This is interesting. I agree with Phil that using ‘Houston’ in the name is causing problems. We have a client (also Houston based) and their official company name includes ‘Houston’. We have been experiencing difficulties with their Google places account. They are in an industry known for having numerous shall we say ‘less than honest’ people operating. I discovered that Google seems to red flag listings in this particular area (saw this in Google’s forum). The client has genuine reviews, listings in the important local directories all using the registered business name including ‘Houston’ but it seems that places page was banned a few months back. We’ve been trying to get it reinstated but no luck dealing with Google on this. Very frustrating as the client is definitely losing business as a result. Regular positions for SEO are great but when the local listings appear then it kills the client’s competitiveness. Someone suggested removing ‘Houston’ from the name but then that ruins the conformity with local directories and it also goes against Google’s own requirement that we use the official company name – in these cases you can’t win! Any way around this or a way to get Google to agree to reinstate? Does the client just need to bite the bullet and remove ‘Houston’? That’s a tough one. It’s hard for me to know for sure what to suggest, because I don’t think I know all the nuances of your client’s situation. Don’t take me to the bank on this one, but I think you should be able to claim the listing using one address and then – once it’s verified – change the address and not have to go through the whole postcard routine again. That’s what I’d try first. If that doesn’t work, or if in your judgment it doesn’t seem as though it will work, you may be out of options as far as Google+Local is concerned. If privacy is absolutely 100% paramount, I probably wouldn’t trust Google to keep the cat in the bag. 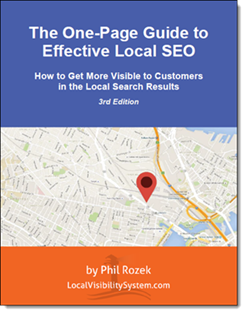 As you know, Google+Local has a strong bent toward businesses for which disclosure of the address isn’t a problem at all – bricks-and-mortar and office businesses and the like. Google doesn’t always have good provisions for that other 1% of businesses. Thanks Phil for your reply. Privacy is absolutely 100% paramount what with colleagues of my client being victims of crimes so I’m going to recommend she doesn’t pursue this further. Luckily her clients aren’t restricted to her city area as she travels all over the country and also goes abroad sometimes. BTW, your blog has quickly become one of my favorite SEO blogs – excellent work! That sounds like a good plan – and exactly what I’d suggest. Also, as you know, organic SEO doesn’t really require anything in the way of address disclosure. Thanks for your compliments, by the way! This is exactly what I was looking for in regards to my own business. Im getting ready to setup my citations, but I have no desire to expose my home address all over the internet. I thank you for taking the time to post this! No problem, Jason – best of luck! I decided to claim my business on City Grid. I am a business owner who noticed that my business was listed on City Grid/ City Search, but that it was not a claimed business. I went through the steps to create an account, update information and received a code to verify my phone number. I went through that process and it worked fine. Within 5 moments my phone rang, it was a CityGrid rep who said he “needed to verify my business listing” and he was extremely aggressive with his tone, and was talking very fast. I listened, and it turned out he was really trying to sell me advertising. He promised the call would only take 15 minutes, and that I would be ‘verified’ at the end. I found that odd, as I had already verified 5 minutes earlier with the code. He stated I MUST go through an ONLINE DEMO. It was a DEMO of a full enhanced top of the line listing, not a DEMO of your account! He directed me to a site called: citygriddemo.com/hisname and then went over everything. At times he was reading his script so fast I lost a few words here and there. He then said “With a basic listing you will only have your Business Name and Phone Number listed, you won’t be in ANY CATEGORY”. He kept talking, and I was trying to interrupt him to find out about that. What is the point in being listed (for free) if you won’t be in a category, so I needed to know more. All other websites always 100% put you in a category. Finally, he came up for air, and it was only after I said “I can’t afford an Enhanced Listing Right Now”, and then I addd I wasn’t sure ” I wasn’t sure I wanted to do business with a company who doesn’t provide a free category”, that he then changed his story to “YOU WILL BE IN A CATEGORY, BUT I CAN’T GUARANTEE IT WILL BE IN THE RIGHT CATEGORY”. It was so frustrating to hear that, as my business is very specific, and there is only 1 category that I truly fall into. So after much intensive argument and debate, he finally said I need to call customer service to claim my business listing. By the way, at the point in the DEMO, where I stopped him to ask the 1st question, it had already gone on for 15 minutes, so the demo must be considerably longer. I hung up with him after he gave me the Customer Service Number: 1-800-611-4827. I recommended anyone calling their first, and avoiding the VERY HARD PRESSURE SALES PRESENTATION. The City Search Customer Service Phone Contact Rep was EXTREMELY NICE. By the way, he CONFIRMED that my listed was indeed already verified from the original code I had got with the automated phone system (right before the Advertising Rep) called me. So in other words, the City Search Representative called under FALSE PRETENSE. He didn’t because I was not a “verified listing”, as the other rep confirmed I was verified immediately with the automatic system. I STRONGLY SUGGEST AVOIDING GIVING THESE PEOPLE ANY MONEY. Thanks for describing that painful-sounding experience. As you know, this post just deals with the free CitySearch listing – not the paid CityGrid listing, whose main benefit is that you can claim it. I can tell you from first-hand experience that if you email CitySearch and specify a business category (assuming they have a category for your business) they’ll list you under it without hassle. Generally speaking, yes, I completely agree that it’s best to avoid IYP reps on the phone – especially if you’re not yet sure exactly what you want and definitely don’t want. My post was in regards to the FREE City Search Listing. When you claim the “free listing”, this is when all the haggling took place today. The rep from City Search called, under pretense to try and get you to convert to the upgraded “Pay per Connection” Link. This is when he started calling it City Grid, but I can assure you this was a Free City Search Listing, that comes complete with sales calls and a hard pressure sale to upgrade to City Grid Paid Listing. When I got through to City Search Customer Service, the Cust Svc Rep told me that actually City Grid is really only a business user interface, for the business user to “see their own listing”. He again stated that I did have a Free City Search Listing. So my point of the earlier post, is that with the so-called Free City Search Listing, once you “try to claim it”, they will call you and make it seem completely impossible to get listed “into a category” unless you upgrade and pay for this so-called “pay per connection” to City Grid. Hmmm…I haven’t encountered that, but perhaps some of my clients have. Thanks for the caveat emptor! My question is bit different..
Thing is I don’t have address in particular city. But my service area includes this city than how can I list my business on Google local for this city ? Good question, Nirav…I’m guessing you work from home? If it’s the case that you don’t have any other addresses you can use, you’ll need to use your home address. That’s because (as you know) Google requires an address for your listing. But once you’ve entered that and verified via postcard and so forth, you can hide the address to whatever extent you’d like. No Physical Location – Yahoo! Local has been designed for businesses with a physical presence. Listings must represent businesses that offer local offline services and promote a physical location. Online businesses can find Yahoo! advertising options through our Search Marketing products found at http://searchmarketing.yahoo.com. I’ll go back to Yahoo Local to see if I can find anything else I did besides click the “do not show my address” box, but it seems to me they are trying to shake down home based businesses for advertisements. Thanks for your article Phil! Interesting. So you did specify an address in Yahoo but chose to “hide” the address? If you email me a screenshot of your Yahoo listing-builder / “dashboard” area or post a screenshot here, I can take a quick look, on the 5% chance I might notice something that you haven’t yet. I guess if push comes to shove, it’s not like being listed on Yahoo is a do-or-die proposition. As for Google, you might be victim to a recent bug that caused a LOT of businesses to get the “Pending” message even when they shouldn’t have. If you’re still running into problems, feel free to describe it over at Linda Buquet’s forum, where I and others might be able to do more in-depth troubleshooting. Well, after posting here, I went back to Yahoo and just resubmitted. I may have changed one category, but not much else. Now… it looks like it’s listed. Thanks again for the great article and the speedy response today! Look forward to following future posts! That’s weird. But hey, I’m not gonna complain! Looking forward to your take on other posts – there are a ton more on the way, obviously. Do you know if there’s a way to take a Facebook business page in which you’ve omitted the street address (but included the town, state, and zip code) and have it show up in Nearby results? My Facebook page is at richardsontechnology, and when I use the Nearby feature on my droid FB app, search for either the business name or “tech support in alamosa” no search results are presented. Thoughts? Hope you have a great day today, and thanks for all the posts! Good question, Jon. I actually don’t know. I haven’t really waded into Nearby yet. Maybe see if Greg Sterling or Matt McGee has any posts on the topic. I’d be interested in hearing what you find out! Hi Phil, great article and lots of good advice in the comments as well. I’m sure this is a very common question… I’m just curious what your thoughts and strategies might be on how a service business who has an office location (home based or otherwise) that is not in the neighboring “big city” where the majority of their clients reside might go about getting listed and ranking in the top 7 of the Google+ / maps listing for local searches? Hi John, thanks for your compliments. In the situation you describe, I’d say the business is out of luck…at least in terms of the Google+Local results. Geography matters – a lot. Always has, always will. Not saying it’s impossible to rank well in the “big” city down the road, but it depends on a lot of factors (e.g. how far away you are, what industry you’re in, how many competitors are actually located in the city). In that case I’d suggest trying to get some organic rankings, as well as doing PPC. I have a question If you are operating lets a say a Web design firm in your small town would you be tapping into searches relating that terms even though the map listing might not show? I noticed many terms not showing maps for the categories within my business listing. Whats your take on it? If I understand the question correctly, you’re wondering whether there’s a way to get any sort of local visibility for terms that, when typed in, do NOT trigger the Google+Local “7-pack” results – correct? If that’s the question, I’d say that your only good option is to go after organic rankings and probably also use PPC. Sometimes Google does start showing the Google+Local results for search terms (e.g. “[city] web design”) that it didn’t used to show them for. But that’s not something one can count on to happen. Will hiding/make private my address in google places and or google plus local remove the streetview photo of my house that shows when the business is googled? Good question, but no, hiding your address won’t affect Street View. They’re totally separate parts of Google. Is there a way to remove the Steetview picture associated with the business, after claiming the pages and hiding the address? Nope – there is nothing you or I can do to change what’s in Street View. Thanks so much for all this info. My business is a direct mail service and I’ve worked out of my home for 16 years. I rent a mailbox at a local UPS store which I use as the mailing address for my business. I recently signed up for Google+Local and entered the mailing address and my listing was rejected. So I deleted that listing and began again, using my home address and hiding it. Currently it’s in the process of being verified. Meanwhile, many citation sites have my business listing with my mailing address. I understand that the search engines need to see consistent info in order to keep crawling them. Do I need to go back to all the citation sites and change my address to my home address and then hide the address? (I ask this because I don’t know if hiding the address that is displayed also hides it from the search engines — so just hiding the mailing address without changing it to my home address might confuse the crawlers) A separate question is whether I can change the citation sites to list just the business name, phone number, city and state. I really appreciate any insight you may be able to offer on this. Thanks! Great questions. 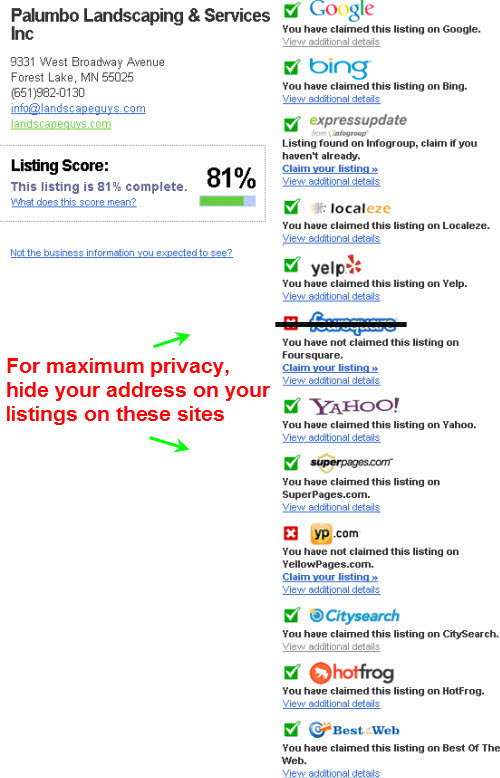 You don’t need to hide your address on the third-party listings; only on your Google+Local listing. The former is a matter of personal preference, whereas the latter isn’t. So, as long as you’re using your home address on Google+Local and all other sites, and hiding your address from showing up on your Google+Local page, you’re all set. Whether or not you’d like to reveal your address on third-party sites is totally up to you. As for your second question, you may want to check out the follow-up post I did to this one. How ’bout if we just list the street name, without the house number? Will this type of listing have a bearing on local rankings? Yeah, it will – in a bad way. Even the sites that allow you to hide your address require that you use a specific address. So in this case, home based businesses can only submit to sites that allow to hide one’s address as trying to submit to sites that doesn’t allow hiding of addresses w/ only street address will only hurt their listings. If you own a home-based business, you can submit to any site you’d like. The only question is: to what extent do you want your address not to be visible to people? Regardless of how many of the “hide my address” boxes you check off, you’ll need to do two things: (1) list a real and specific address (meaning one with a street number), and (2) list that address on all the sites. I have a client with a Places page address in a smaller, neighboring city. They now have an office in a larger city. Switching to the larger one would have obvious advantages, but perhaps not, since they are service-area business anyway. Everything I’ve read says that they would have to close down the current location and re-verify the new address, and guess that means their reviews/citations (14+) would go with it. Any experience with this scenario? Hi Phil, thank you for writing on this topic. I have a home based business providing web design, social media, etc. services. I purchased a p.o. box address a while ago for my business. Someone suggested to me to use the physical address of the post office to get listed on the top business directories and use the box number as a Suite # within the address. The post office even said that it is ok for me to use the post office physical address on my business cards, website, etc. But now I’m concerned that because my business is not really at that address that this may have not been a good idea. Will Google take my business listing down eventually? will they discover that this is the post office address? Should I go into my listing and hide the address? And cross my finger that I will still be found by customers looking web design services, etc. in my local area. Yes, Google will pull your listing sooner or later – if they haven’t penalized you already. Using a PO Box is the ultimate no-no in local search. Hiding the address won’t change anything, except to make it so that people who visit your listing won’t see your address. Google still has your address on-file, and therefore “sees” it. I would suggest using your home address across the board. Thanks Phil. I’m not using the P.O. Box address in my listing but the actual street address of the post office with my box number using as a suite number. Is this still not a good thing to do? No, I wouldn’t suggest using a PO Box or any sort of postal address in any way, shape, or form. Google knows the address of the post office, and knows that the only business that is actually located there is the Post Office. Thank you for your quick reply to my comment! I will definitely take your advice into consideration. Thank you for posting such great information to help local business owners. Have a great day! My colleague just got her business listed on Google Places, AND she used the street address of the post office. She is in a small city, so maybe they have less aggressive Google Places defenders there. That wasn’t a good move. It’s true that – as you say – the rules tend not to get enforced as consistently in small towns. But it’s also the case that even if Google doesn’t pull your listing outright for using a PO address, you generally won’t rank well for one reason or another. Your colleague may be OK for a while, but using the Post Office’s address simply isn’t a solid long-term strategy. Question: Can a service-area business have 2 locations (provided that in both cases the addresses are hidden)? I can’t find an answer to this anywhere. Yes, but only if those addresses are real addresses – like home addresses (which are usually what service-area businesses use) – that belong to the owners of the company. Another caveat: I wouldn’t suggest setting up two Google listings in the same town, if you have a service-area business. I’m done for my clients is signed them up with a virtual address from Regus, which usually goes for $80-$100 per month. Its either this or ask your friends and family if you can borrow their physical address for a google business location which is probably the most affordable way. Do take into consideration when using your home address you will, some times, have random people looking for your services at our front door. Phil, this is an excellent article! As an agency we have a lot of clients that want their addresses hidden from the listing sites. For those that WANT their address visible, how important is it to claim and change a listing if one says Street Vs. St. or Boulevard Vs. Blvd. Also in regards to business name, Sample Services Vs. Sample Services, LLC or Sample Services, Inc. Are those abbreviations crucial to search results? I loved this article and would SO LOVE a revisit of the topic. I have one client I am doing, for example, a sweet over 70 year old lady – she teaches piano. Her sister’s husband lost a lot of money in the rescission and she has stepped up to the plate to help her nephew stay in college. It’s her retirement money. – So in a nutshell, she teaches more piano and needs to reach out beyond to word of mouth, but she doesn’t want to give out her address until someone is coming for a lesson – not advertise it to the world via the internet basically. She feels its a safety issue. – So there’s one kind of person that doesn’t want their address connected with their business. And the folks that worry that there is some kind of old community code saying you can’t run a business from your home. I say old – because seriously – how many kinds of businesses can now be done from someone’s home and have no impact on their local neighborhood? No “to the door people traffic” – not even deliveries now that there is drop shipping etc. My example: I have a client in an urban area that sells equipment for horses – saddles, water troughs, special carts – none of which come to her door ever – even the special made – special orders. She does do a lot of sales within a 5- 50 mile range – so local is important, plus she makes connections at horsing events. Yet her town looks at “Home Businesses” as shady, so that’s another bunch that may not want to pop up in the cities’ search map.